How can I make my Canvas site accessible? While Canvas is ahead of other learning management systems when it comes to accessiblilty, part of ensuring a platform is as accessible as possible takes place during the content creation. Canvas itself is 508-compliant, with homogenous color schemes across the board, clean designs, and tab-navigatable menus. If a user takes the time to follow this example, choosing clear designs in creating Canvas pages, modules, and so on, then both platform and created content will be accessible. At the end of the day, though, what this really means is getting into the habit of generating alternate text. Alternate text is one of the more important aspects of accessibility, yet is often overlooked. 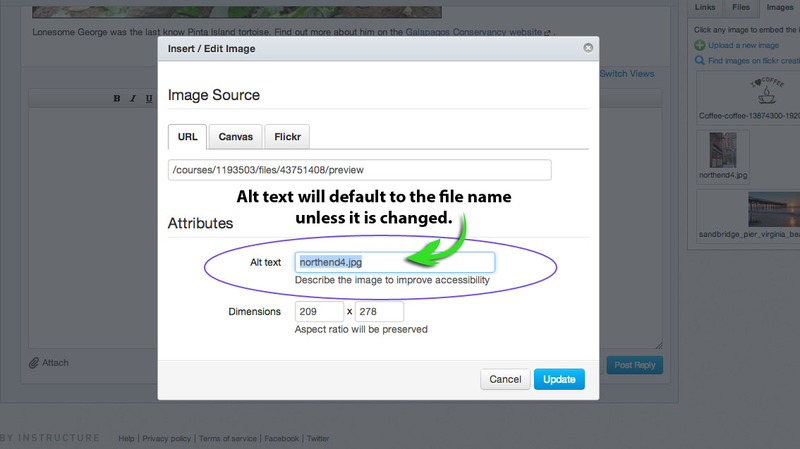 Tags on images - called alternate text, alt text, or alt text tags - are ways for a screenreader to interpert that image for a user. Without "alt" text on an image, a screenreader cannot do its a job fully. In all likelihood, it will just read the image's file name like "somepic2014.jpg." You want to make sure that 1) you include alternate text and 2) what you write is applicable in the overall flow of the page. 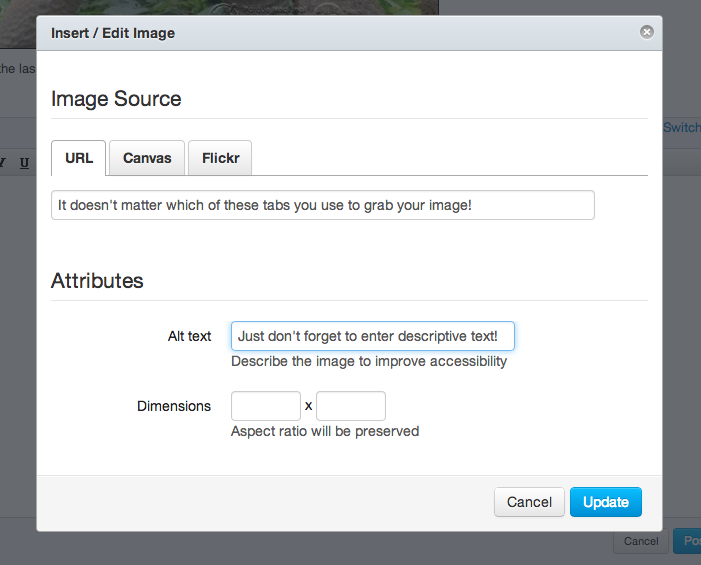 The way you write your text tag will depend on how the image works in relation the text. 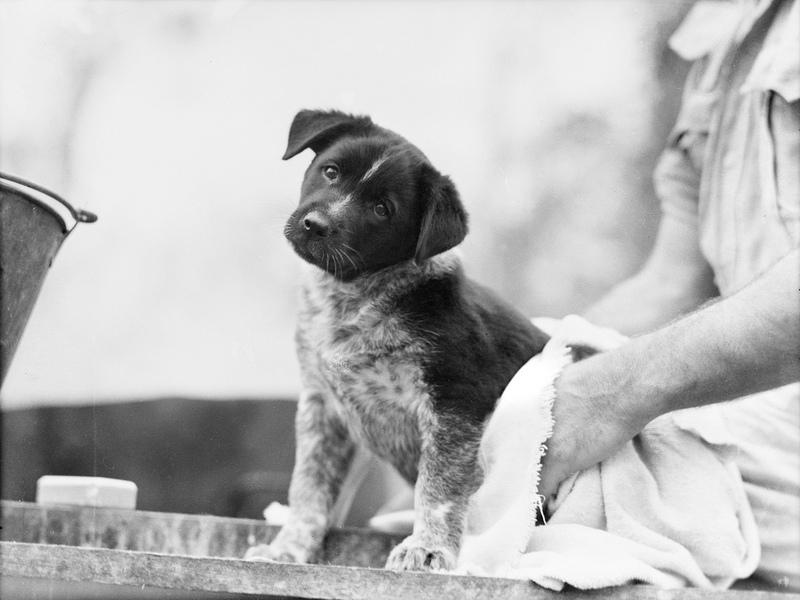 If you were talking very specifically about the Flickr collection, World War II, and dog mascots, you may want to put in a tag of something along the lines of "Black and white photo of puppy mascot, being dried after a bath." Usually you would not include the word "photo" as a screenreader can detect an image. But in this case, the black and white photo part of it is crucial information in the description. If you were just including a picture of a dog, and further context was not necessary, you could put "Drying a puppy after his bath." Or, if this was related to dog breeds, you may put in "Stabyhoun (or perhaps Large Münsterländer) puppy mascot of Australian Army, 1943." Alternate text is not always the easiest thing to generate. It seems obvious and perhaps simplistic, but it is actually powerful and a lot harder to write than you might think. Click here for original mascot image on Flickr Commons. There are two ways to add alternate text in Canvas. Actually, there are three, but the first two ways land you in the same place, and the third way involves a tiny bit too much coding, so let's stick with what Canvas gives us. Enter your text and hit update.